GRANTSVILLE, Utah – Scott Heckert, driving the No. 54 SIN Cars/Racers Edge Motorsports SIN R1 GT4, converted a second-row starting position into the top podium spot in GTS Round 15 at the Grand Prix of UMC presented by Energy Solutions. Owasso, Okla., resident Nate Stacy secured the second position on the podium while Allendale, N.J.’s Brett Sandberg held off enough advances to capture the third step. 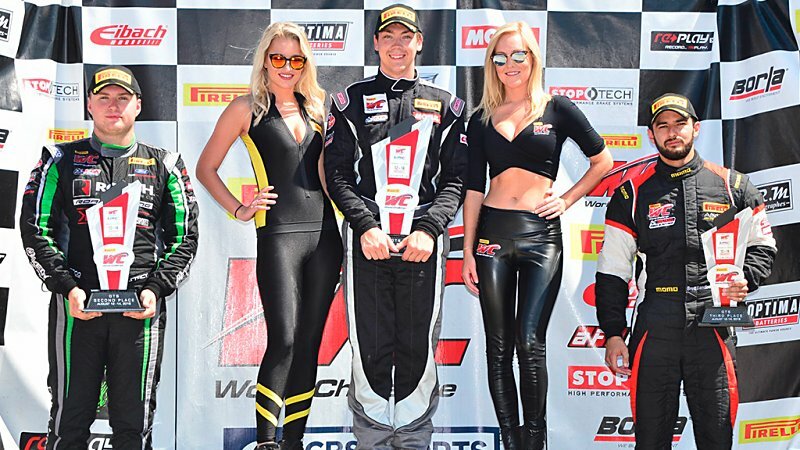 Heckert, 22, a mechanical engineering student at Miami University and originally hailing from Ridgefield, Conn., performed well enough for a fourth place finish in Saturday’s race with a best lap time that placed him in P4 on Sunday’s standing-start grid. A stall from pole-sitter Anthony Mantella (Toronto, Ont., Canada) in the No. 8 Mantella Autosport KTM XBow GT4 allowed Heckert to shoot to the front of the pack, where he stayed for the duration of the race, building a lead as high as 7.8-seconds ahead of the next contender. A fast and steady pace ensured he stayed there, even under a late full-course yellow that equalized the pack and lifted into a white flag, where Heckert’s final margin of victory was provisionally set at 1.014-seconds.